I have probably eaten more at Mama Noi as much as any other restaurant in Phuket. Why? Well, it's just round the corner from where I work at Sunrise Divers in Karon Beach, about 1 minute walk from door to door. Sure, there are a few other nearby options such as a (very) local roadside restaurant that does great Phad Thai for 50 Baht, a place called Pim's Kitchen which is over the road from the 7-11 100m away which does simple cheap Thai food, and the very good Sala Bua which is part of the Karon Place Hotel and only open in high season, but Mama Noi keeps me coming back. 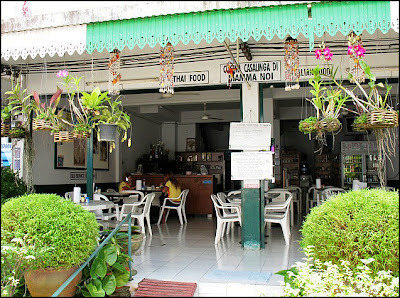 You'll find Mama Noi next to the Siam Commercial Bank, just off the back road (Patak Road). 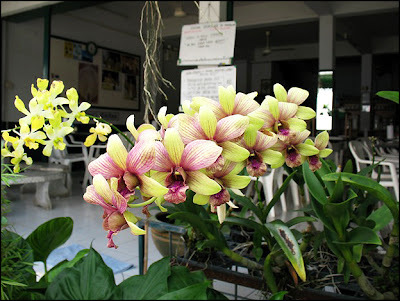 It's easy enough to find and always looks clean and welcoming, with green plants and many colourful orchids hanging outside. There's nothing really fancy here, but it has many regular customers (myself included) - foreign and Thai alike. A restaurant with regular local customers is always a good sign. Inside you may notice signs saying "Self Service", and indeed this is half true. You will need to place your order at the counter, then take your own cutlery and glass of water to your table. Drinks are in a large glass front fridge - again, self service. BUT, not all drinks are in there. 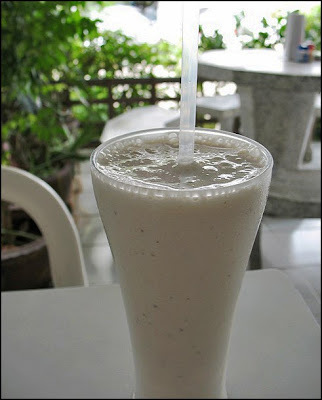 I almost always order a banana milkshake (Kluay Pan) - the best I have found anywhere and only 40 Baht! Food - the name Mama Noi suggests Italian connections and the original owner (as far as I know) used to live in Italy. 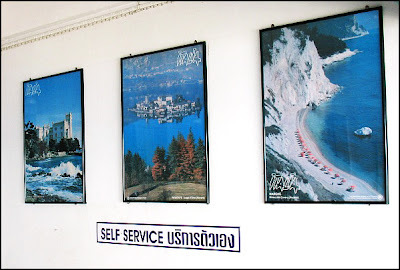 The western menu includes pasta, lasagne, salads, sandwiches, chicken and chips and more, while the Thai menu includes basically any Thai dish you can think of. My current favourites - Yellow Vegetable Curry (Gaeng Garee Pak), Fried Pork in special sauce (Moo Phad Mama Noi), Chicken Penang Curry (Penang Gai)... The minestrone soup is not bad either and the sandwiches are decent.. the Massaman curry is good too.. in fact I don't really recall a duff meal here though the fried rice tends to be rather bland.